Maple syrup may be the most unusual agricultural product in North America. It doesn't grow on trees, it flows through trees. It is simple to make, yet so complex that scientists continue to discover new compounds when they study it. It has often been imitated, but never truly duplicated. Maple syrup is what gives pancakes a reason to exist. It has been around for centuries. But why is it so special? The secret is in the sap of the sugar maple tree. It is sweeter than the sap of other trees, containing as much as 2% sugar. These trees produce a flow, or run, of sap during certain times of the winter which can be tapped so the sap can be collected. When boiled down it becomes maple syrup. Boiling the sap even more causes crystals to form, producing maple sugar. This was the original product made from the sugar maple and so collecting and processing sap is known as sugaring. Sugar maples get their name from the high concentration of sugar in their sap. This is what makes maple syrup possible. The sugar maple is native to the northeastern portion of North America. It is responsible for the wonderful fall colors of the forest, as the bright green maple ;eaves turn to brilliant yellows and reds. Sugaring is an important part of the economy in the northeastern United States and eastern Canada. It is a northern crop because the sap can only be collected when below-freezing nights are followed by warm days. Although maples can grow in warmer climates, the weather conditions do not allow the trees to produce the sap run needed for sugaring. Native Americans had already mastered the art of sugaring by the time European explorers arrived. The tools used are not preserved in any archaeological sites, but according to accounts dating back to the 1500s sap was collected and boiled down into maple sugar as a community activity. The first step was to make the tools. Containers were made from hollowed-out logs or constructed from sheets of bark. Log containers could be placed directly in a fire, while the contents of a bark container could be heated by cooking stones. These are stones which are heated in a fire then moved into a container to boil water or other liquids. Once the containers were prepared, diagonal cuts would be made in the tree and curved pieces of bark inserted at the bottom of the cut to direct the flow of sap. The collected sap was then heated to remove the water and reduce it to sugar crystals. As settlers brought new technology to the area, Native Americans began using metal cooking pots. Despite this and other technological advances, the basic process of sugaring has not changed. When European settlers arrived, Native Americans taught them how to harvest sugar. The settlers soon began using the technology they had brought with them. They tapped trees by boring holes, rather than making slashes. 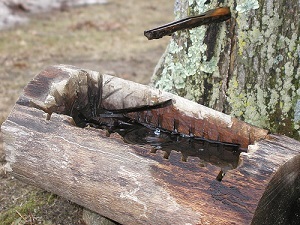 Spouts made of wood directed the sap into wooden buckets. These could be carried to the cooking fire where the sap would be boiled in metal kettles. At first, sugar was made for home use. It gave families a way to have sweets without buying expensive imported sugar. As settlements grew into towns, and towns grew into cities sugar became a commercial product. Gradually, sugaring became an industry. A stand of trees used to produce maple syrup is known as a sugar bush. The typical sugar bush consists primarily of sugar maples, but may also include black maples, red maples and silver maples. A single tree can produce up to 20 gallons of sap per season. This is the equivalent of one-third gallon of syrup. The actual volume will depend on the tree, how long the sap runs and weather conditions. 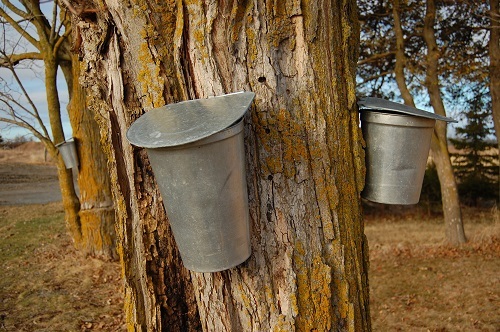 Syrup producers use various methods of sugarbush management to maintain healthy and productive trees. In order to be tapped, a tree must be at least 10 inches in diameter and about 40 years old. Ideally, the sugar bush will contain trees of different ages, with a few trees of other species. This diversity is essential for the health of the trees. Sugar maples require well-drained land with good soil. For the best quality sap, trees should be spaced so that each has room to grow a large, well-developed crown. Old or diseased trees must be cleared out to make room for new growth. A sugar bush is a living thing, and has to be maintained year-round. 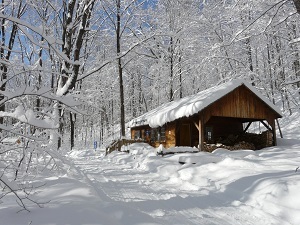 Sap is processed in a facility called a sugar house or sugar shack. This can be a simple shed with a heater to boil sap. It can also be a large factory filled with sophisticated equipment - or anything in between. Because syrup making is at heart a very simple process, it is up to the syrup maker to decide how much advanced technology should be involved. It's all about temperature and pressure. The warmer days that happen in late winter cause pressure to build up in the tree. This pressure forces the sap out to tap holes or other breaks in the bark. When the temperatures drop below freezing again. the pressure is reversed, pulling water back up into the tree. Now the tree is once again filled with sap, and the cycle is ready to repeat. Sap flows through sapwood, which is in the outer part of the tree trunk. This type of wood carries water and essential nutrients in the form of sap up from the roots of the tree to the branches. The cells of sapwood produce carbon dioxide during the day. The carbon dioxide collects in the spaces between the cells. At the same time, carbon dioxide also exists dissolved in the sap itself. This is also released into the intracellular space within the sapwood. All this carbon dioxide creates pressure in the cells. The next element in the process is osmotic pressure, which is triggered by sugars and other compounds in the sap. This combination of pressures is what forces the sap to run out of the tree when it is wounded. That is why maple producers are able to tap trees and collect sap during the sugar run. When the temperatures go below freezing, the carbon dioxide also cools which causes it to contract. As the sap cools It also absorbs carbon dioxide. Lastly, a portion of the sap freezes. These events combine to create suction in the tree, which pulls water up into the roots and eventually into the sapwood. 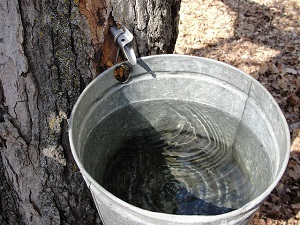 If temperatures rise above freezing the following day, the sap runs once again. It was not until shortly before the Civil War that maple syrup became an industrial product. By this time, cane sugar was more popular than maple sugar in the US, so it was time for a change. Technology was ready to oblige. The first flat-bottomed evaporator was patented in 1858. This eliminated the round kettles that had been in use. The new evaporator was wider and shallower. It had more surface area for heating the syrup and for allowing the water to evaporate. This was the first of many improvements to make it easier and faster to produce maple syrup. In the 1870s, the arch was invented. This is a device that combines two pans with a firebox. The arch cut back on boiling time, saving money and increasing productivity. Later the pans changed again as manufacturers shaped the bottoms into a series of baffles or flues. This put more surface area in contact with the fire and led to yet another reduction in boiling time. 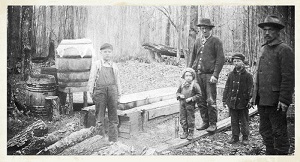 Energy costs have always been one of the most important factors in making maple syrup. 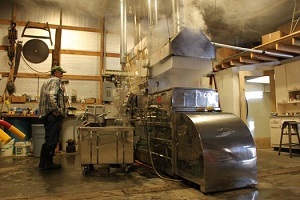 In a wood-burning evaporator, it takes a cord of hardwood to produce 20 gallons of syrup. In contrast, an oil-fired evaporator uses three gallons of fuel to make one gallon of syrup. Improvements were not limited to the sugar shack. Horse-drawn sleds had long been used to transport sap for processing. Tractors sped up the process, hauling even larger loads to the evaporator. Wooden taps and buckets were replaced with versions made of metal. As new materials became available, some syrup makers even replaced metal buckets with plastic bags. This made it easy to see from a distance whether it was time for the contents to be collected. Some innovations were more successful than others. In 1916 a system of collecting sap via metal tubing ran into problems with leakage and freezing. Collecting sap by means of tubes would not be feasible until the 1960s. Even so, syrup makers continued to push past the limits of the older methods. While sugaring methods kept improving during this time, it was not until the 1970s that modern technology really entered the picture. Modern technology has brought improvements to all aspects of syrup making. New tap designs keep sap from flowing back into the tree and introducing bacteria. Plastic pipelines move the sap directly from the sugar bush to the sugar house for processing. Vacuum pumps increase the yield without harming the trees. Reverse osmosis systems help to remove a large portion of the water out of the sap. Evaporator systems now process sap continuously. Fresh sap is added at one end, and highly concentrated sap removed and finished on other machines. This reduces energy cost and saves time. Equipment manufacturers constantly work on improvements such as air blower systems for arches that are heated by wood and improved filter systems for bottling. New electronic controls help produce more consistent results. Maple syrup is the only agricultural product in North America where there is more demand than supply. The future holds a number of challenges for sugaring. Climate change has altered the sugar run, starting it earlier and ending it sooner. Some scientists believe that the productive range of the sugar maple may be changing. The shorter run also presents a challenge to collecting enough sap. Vacuum collection systems help with this, and researchers are watching the health of the trees closely. Improved methods of woodlot management keep the trees strong and productive. Science and technology are working together to protect this natural resource. Whether the growing range of the sugar maple changes or not, there is no end in sight for maple syrup. And that's a good thing for pancakes.